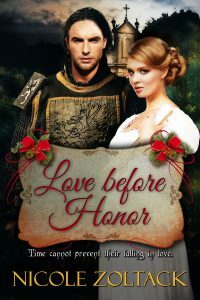 To avenge his love’s death, Sir Gerald challenges her murderer to a duel. Her twin, however, feels that Alice never loved the knight and gives him a tea that sends him to into the future, to the Regency era. Scandal has forced her parents to accept William as their daughter’s best chance at marriage. Although rich, he does not understand her or her love of books, whereas Gerald listens to her, confides in her and she him. With the approaching holiday, nothing is certain – not whether Gerald can discover a way back to his duel, whether he can move on from Alice, and not whether this Christmas will be a happy one for either Gerald or Vanessa.